“I don’t know what we will leave our young daughter,” said a teacher about the island's economic situation. SAN JUAN, Puerto Rico — Reeling from the sluggish hurricane recovery efforts and steep budget cuts to tackle the island's fiscal crisis, Yariela Montes, 41, was one of several thousand Puerto Ricans who took to the streets in a May Day march on Tuesday to protest school closures and austerity measures that could result in significant pension cuts, higher college tuition costs, and reduced paid sick and vacation days. Montes, a teacher, doesn’t know if she will have a job in August. Her school is one of the 280 public schools in Puerto Rico that are scheduled to close, and she is worried there won't be a slot for her in another school. At the same time, Montes said she and her husband don't know how they will afford a tuition increase at the University of Puerto Rico, where her older daughter is studying. A recently approved fiscal plan lays out a series of budget cuts and agency consolidations to set a path for the island to restructure its crippling $72 billion public debt — all while still recovering from Hurricane Maria. #ParoNacional | 2:11 p.m. Comienza confrontación entre manifestantes y policías. Arrojan gases lacrimógenos. There were clashes as some marchers went to an area that police said was blocked. Some protesters threw rocks and other objects toward police and there were reports of vandalism. Officers threw tear gas, and there were several people vomiting as they ran away from the scene. But most followed the route without incident, and the march ended with a rally in front of the Capitol in San Juan. At least eight people were arrested and a number of people were injured, including fifteen police officers. At an afternoon news conference, Puerto Rico Gov. Ricardo Rosselló said authorities will investigate the incidents, and did not rule out investigating any police actions. "Let's not allow violence to run in our streets," said Rosselló. According to the ACLU chapter in Puerto Rico, police officers disproportionately used violence against demonstrators, reporters and legal observers, followed by warrantless arrests of protesters in their homes and university dorms. 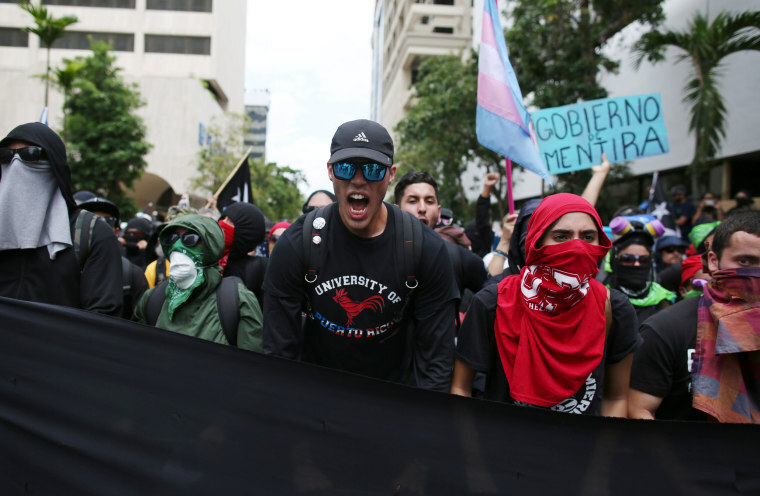 Among the marchers were college students, teachers, retirees, union workers and some government officials, such as San Juan Mayor Carmen Yulín Cruz. “There are retirees here who are going to lose their pensions, there are students, there are employees who are going to see money for their medical plans taken away,” said Yulín Cruz at the beginning of the march, pointing to people holding signs and posters. The Fiscal Control Board is the result of a law approved in 2016 by the Congress that imposes a federally appointed board, known as the Financial Oversight and Management Board (FOMB), to oversee the island’s finances as it attempts to claw back from its crippling debt. Speaking about the protesters' criticism of the budget cuts, Edwin Meléndez, director of the Center for Puerto Rican Studies at Hunter College in New York, said that it is true that, "in many instances, the austerity is disproportionately affecting the most vulnerable populations — it could be a more equitable reform that would be more balanced in terms of cutting services,” Meléndez said. But for the island to chart a path toward sustainability, he said, it has to examine why the U.S. territory ended up in this situation in the first place. "The question is, what is causing the austerity and how did we get here?” he said. Nicole Acevedo reported from New York, Istra Pacheco from Puerto Rico and Carmen Sesín reported from Florida.